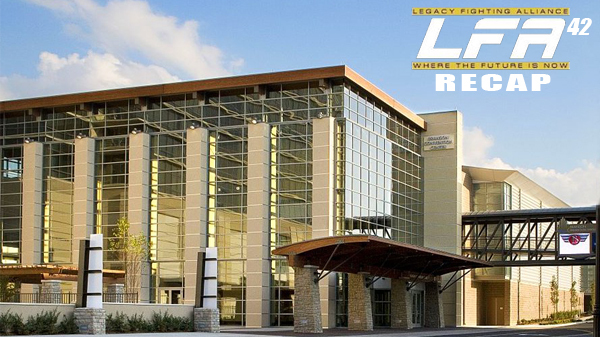 It was lights, camera action at the Branson Convention Center for Legacy Fighting Alliance 42 on AXSTV. The Midwest's live music capital of Branson, MO is becoming a favorite stop for the nationally touring LFA, and the local fans were treated to plenty of theatrics including a pair of final round submissions, vicious one-punch KO's, and a back and forth lightweight fight that easily stole the show from the headliners. Kassius Kayne and Derrick Krantz took main event honors in a classic match-up of striker versus grappler, and in the end, it was Krantz's wrestling that won him the fight on a very odd scorecard from the judges. Kayne came out strong, connecting with punches and kicks against Krantz who looked eager to take the action to the mat. Krantz threatened the stoppage in the second controlling most of the round from side control and half guard while landing punches and elbows from on top. In the third Kayne went for broke with a flying knee, and an athletic jump to the back of Krantz, who was able to defend and put Kayne to his back. Krantz ended up in his half guard, before eventually gaining the mount, and working for a stoppage. After the final bell, the scorecards were read with Krantz winning a split decision 30-27, 27-30, and 29-28. The night's co-main event featured Jaleel Willis and Chel Erwin-Davis going at it, and it was all Willis in this one. Willis, out of Memphis, TN, connected with a big knee against the cage to put Erwin-Davis into a heap. Willis followed up, landing undefended strikes to force the stoppage. Willis improves to 9-1 winning two out of his last 3 for LFA and could be working his way into a LFA title shot before too long. Jamie Nievera picked up a unanimous decision victory over hometown favorite Katy Collins from the Branson Fight Club. Nievera out-grappled Collins to get the edge on the judges' scorecards to take home a victory. In a featherweight match-up, Teejay Britton took on John Marsh from Roufusport in Milwaukee, WI. From the opening bell, Britton was the aggressor, as Marsh stayed calm and waited for the opportunity. At 1:14 in the first that opportunity came, and Marsh connected with a straight right that landed on the button to put Britton out. Charles Johnson barely broke a sweat in a first-round stoppage over Andrew Kimzey. Johnson pressured Kimzey into the cage forcing Kimzey to take an ill-advised takedown attempt. Hipping out, Johnson sprawled out of danger and turned up the heat landing a flurry of strikes to a turtled-up Kimzey. Kimzey survived the initial onslaught but never got to his feet, and Johnson continued to land shots from the top forcing referee Mike England to wave things off at 1:41 in round one. "I've been in a lot of battles so far in my career, so it was good to get in there and get a quick win," Johnson said. Johnson is now 7-1 as a pro and jumps to the top of the list of unsigned pros fighting out of St. Louis. It puts Johnson at 2-0 in LFA and talks of a possible title bout are starting to circulate. "We're talking about a title fight between me and Mikail Perez," Johnson said. "I'm going to try and get that in motion. He's a Cuban Olympic wrestler, and the current flyweight champion. I've been talking to LFA, it's not official, but I'm trying to get some steam on it." Lightweights Lucas Clay and Mike Breeden put on the performance of the night with a gutsy three-round brawl. Breeden came out firing, connecting with a big overhand right and pushed the action against the cage opening up for Clay to jump on the back of Breeden where he would remain for most of the first round. Breeden defended Clay's submission attempts perfectly and eventually worked his way free. Clay punctuated the round with a spinning back fist that connected. The second started quickly with both landing heavy punches and trading inside leg kicks. Breeden continued to attack the leg, and it seemed to pay dividends late in the round when a perfectly timed kick forced Clay to take a knee. Breeden connected on a higher percentage of shots in that stretch to even the contest at one round a piece. With the scorecards tied, you'd be hard-pressed to find a better round as both went for broke. "I was thinking, I'm a grown man, and he ain't about to push me around like this," Clay said. Neither could get it to the ground, and both landed frequently. Clay seemed to have the most energy as the round ended and controlled the pace. When the cards read, the judges gave the nod to Clay with a split decision. "In the end, I was completely satisfied either way," Clay said. "I had come to terms with it. This was a close fight, and I could lose it, but this is exactly what I wanted. I'm not going to have too many of these in my career, but I'm glad I can show people I can have a dogfight and come out on top." Clay remained undefeated and moved to 4-0. Leading off the televised main card were light heavyweights Julius Anglickas and Erick Murray Jr.
A quiet first round saw both feeling each other out on the feet, Anglickas scored a late takedown to end the first round on top. Anglickas came out on fire in the second landing a beautiful combination of knees and elbows with Murray Jr pushed up against the cage. Two takedowns scored points with the judges, but never really put Murray in danger. Anglickas was ahead on the scorecards, going into the third, but the cards were not in need as Anglickas got the tap at 2:49 in the third via rear naked choke. Anglickas improved to 3-1 in his LFA debut. St. Louis' Ty Flores went into hostile waters to face popular local fighter Marco Hutch in a middleweight bout. Hutch was near perfect as an amateur and undefeated as a pro going in, with the majority of those contests taking place in Branson. Despite Hutch finding success early with his kicks and landing some solid knees from the clinch, Flores slowed things down with his wrestling hitting a pair of takedowns. "I'm a little bit bruised, but I wasn't stunned at all," Flores said. "I was just kinda hanging out there. I'm a slow starter. I think towards the end there, I kind of rocked him and he went back a bit before I went for the takedown. I kind of wanted to mix it up a bit with the strikes and the wrestling and I think I did that." Flores spent a good chunk of the first in Hutch's half guard where he worked elbows from the top. In the second, it was more of Flores' top control, working from side control after the takedown, before securing mount, and eventually, the back of Hutch where he finished via rear naked choke at 2:02 in the second. Flores improves to 5-2, winning three straight. "Feels great," Flores said. "My last loss was after nearly a two-year layoff. I had knee surgery in November, it's just now been six months, and I've had two fights since that. My knee feels fine, I feel good and want to stay active." In the night's first professional fight, Frank Cortez only needed 16 seconds to even his record at 2-2. Cortez from Dexter, MO landed a beautiful counter punch off a low kick to put Ryan Erickson to the floor, Cortez swarmed in, landed a couple of hammer fists, and the fight was called. The early prelims featured two amateur bouts and saw Dallen Gettling unleashed his secret weapon, a spinning back fist that flattened his opponent Nate Free late in the third round. Local fight fans may be familiar with Gettling's in-cage work as the full-time announcer for local Branson promotion ShowFIGHT, stays undefeated and improves to 4-0. Kicking off the prelims, Josee Storts defeated Lesandra Franklin by unanimous decision, 30-27 on all three scorecards. A scheduled bout between Larry Sellers and Dustin Stewart was scratched before bell time.